3D scanning, modeling and printing are all big topics here at CES 2015 – so much so that there is an entire section at the Sands Expo convention center dedicated to companies within the category. And while we’ve seen lots of people take selfies while roaming the show floors, none of the results can compare to Fuel3D‘s handheld 3D scanner Scanify. 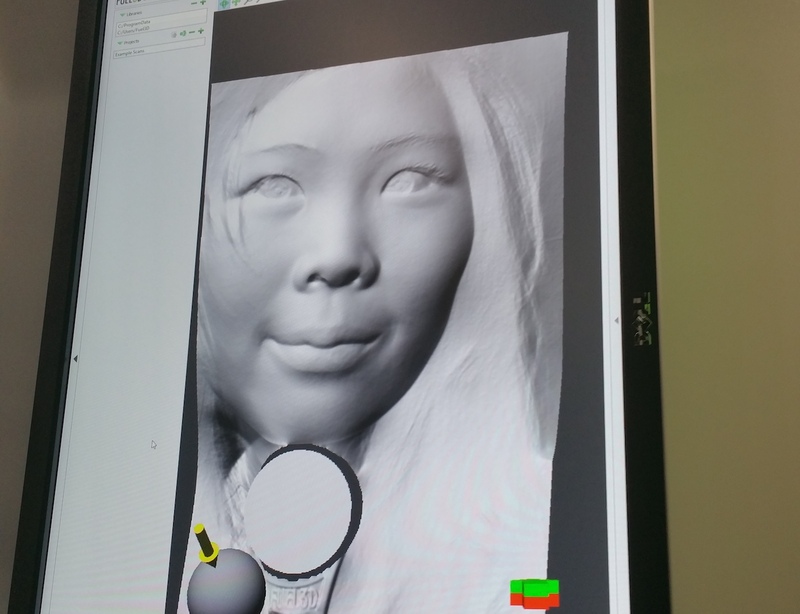 Unlike traditional 3D scanners which are large, mostly immovable and rely on lasers to capture image, the Scanify is portable and uses two camera lens and three flashes to snap the photo. The technology is akin to the human eyes, which combine images from your left and right eye to see a 3D image. 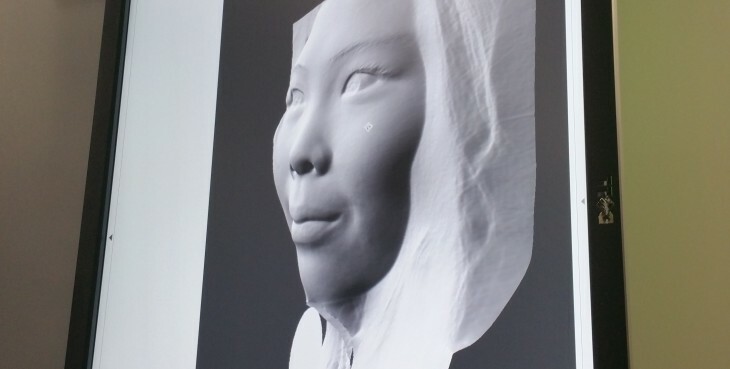 With this technology, Fuel3D Chief Marketing Officer Stephen Crossland says 3D scanning will be more flexible for designers and developers since they can take photos of virtually anything and retain all the details without having to manually render multiple images onto a 3D model. Scanify comes with proprietary software to help edit the image as needed. Applications range anywhere from 3D prototyping, video game development and even custom nail art for an individual’s specific nail width, length and curvature. 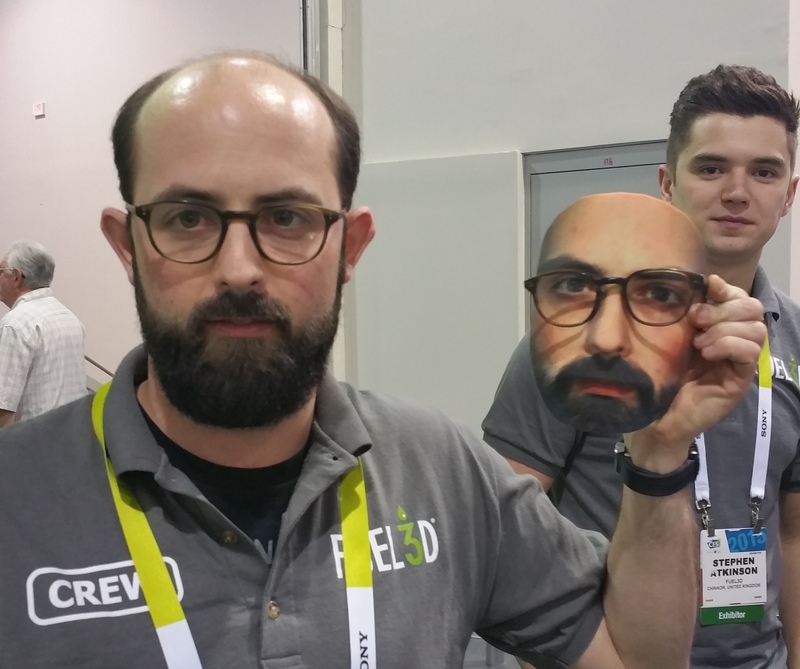 Fuel3D CMO Stephen Crossland with a 3D-printed model of himself. Glasses not included. But this being CES, and selfies are all the rage, we decided to opt for something more simple. Fuel3D offered to take my photo and convert it into a 3D model, which is definitely unlike any selfie I’d ever taken. In just a few seconds, some bright lights flash and my photo appears on the computer screen. There is a level of detail in my skin texture and facial structure that I never knew I needed to see. Theoretically, to get the full 3D photo, about two more photos would be needed to capture the sides and back of my head. Compared to the xxArray, which I checked out at last year’s CES, the process was much more streamlined. The xxArray employs 68 Nikon DSLRs while Scanify took just one photo (albiet, this wasn’t a full body photo, and it was not going to get animated into a playable video game character). Still, there is great accuracy in the pic – down to the fine strands of hair and the blue contact lens around my irises. Fuel3D says it’s excited about the prospects of its product being integrated in various use cases, and since the core technology is so simple, maybe one day we’ll see it shrink down to fit a laptop, webcam or smartphone. The question is, are you ready for a world of 3D selfies?